Watcher4site is a system, which allows you to keep track of all changes in files on your site. 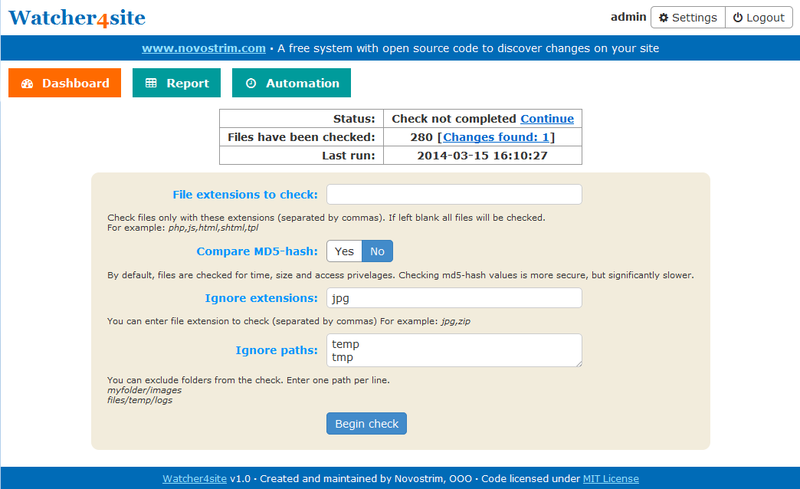 It allows you to find virus infiltrations on your site and all changes in files (scripts). It is freely distributed, and has open source code. It is easy to install and has a simple interface. Using this system will require PHP and MySQL. Eonza - Create your own data storage! Eonza is a free hosted application that lets you keep all necessary data accessible from anywhere and work with them. Now you can fully own your data, and you don’t have to depend on any third-party services! This software product is distributed under the MIT license, so you can download and install it on your web hosting for free (all you need is PHP and MySQL). You can even use if for your commercial purposes. You can keep data not only as tables, but also as documents, photos, and other files. You can upload files to your storage anytime and always have them available for you. July 25, 2014 Eonza v1.0 was released. May 30, 2014 Watcher4site v1.1 was released. March 05, 2014 Watcher4site v1.0 was released. Copyright © Novostrim, OOO, 2014-15 All rights reserved.